I saw Mr. Martinez in the clinic for a routine AAA exam. The aneurysm was found incidentally on work-up for MI at another hospital, and this was the first time he had been seen in our lab. When I made contact with the transducer, a round, anechoic structure immediately stood out. At first I thought it was the aorta, but it just seemed too superficial for that to be right. Once I turned the color on, it was clear that this was not the aorta. It was the superior mesenteric artery! 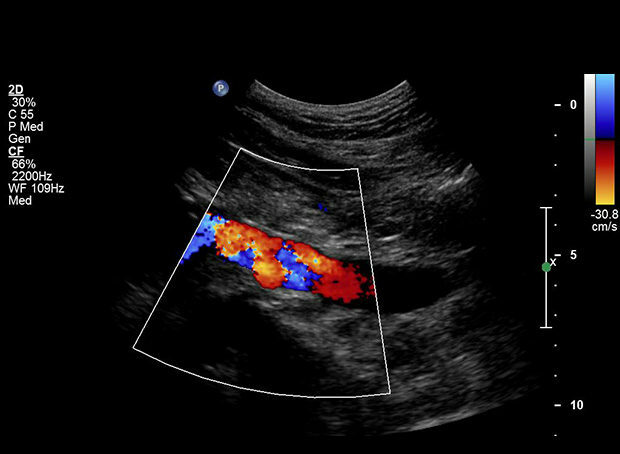 The vessel lumen looked normal, but there was a well-defined dark area surrounding the proximal portion of the vessel. In the transverse plane, it looked exactly like a target – dark around the outside, with a red bulls-eye on the inside. I obtained diameter and velocity measurements (as per our protocol with any incidental finding) and continued on with the rest of the exam. Small aneurysms of the distal aorta and bilateral common iliac arteries were also identified. Given my strange findings, I immediately reported the results to the attending physician, who ordered a CT. The CT showed that this was no aneurysm at all, but was actually a mass that completely encircled the superior mesenteric artery. Further work-up was ordered and a biopsy was ultimately performed which showed the mass to be cancerous. Very scary – at first. Pathology reports showed it to be a very slow-growing, non-aggressive type of lymphoma. After discussion with his doctors, Mr. Martinez opted for periodic surveillance of the mass with CT and PET scans. Repair would have included a major surgery with a large abdominal incision to allow excision of the mass and reconstruction of the superior mesenteric artery. This turned out to be a good decision. The mass had one episode of small growth, but with oral chemotherapy shrunk back down and has not grown since. The patient remains asymptomatic and is doing well overall. We continue to follow his AAA, which had grown to 4.8 x 5.0 cm on the most recent exam. Once it reaches 5.5 cm, he will have it repaired. I learned one very valuable lesson from this: always investigate incidental findings! If something looks strange, check it out. You may be wrong. You may not know what it is. It may be nothing. But if it turns out to be SOMETHING, those extra few minutes are always worth it. This course is designed for physicians, nurse practitioners, physician assistants and other allied health professionals interested in basic point-of-care ultrasound. Symptoms (described) No symptoms. Patient was referred for AAA assessment. Health Status CAD with recent percutaneous trans-coronary angioplasty. HTN, hyperlipidemia, ex-smoker (quit >40 years ago). Family hx, father died of ruptured AAA. 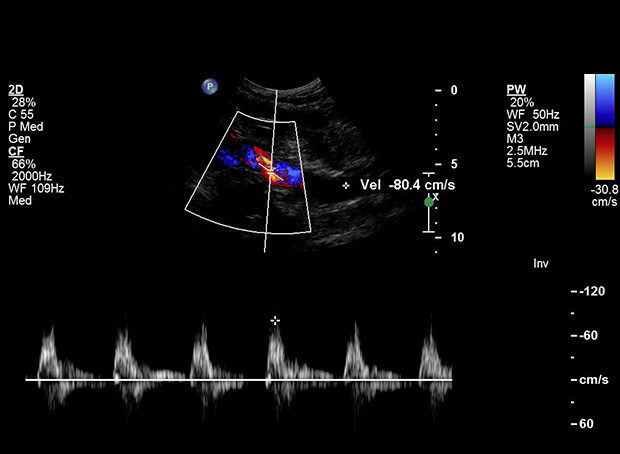 Describe (where, when, how): Abdominal aorta measured at proximal, mid, and distal segments in transverse and AP planes. Proximal common iliac arteries also measured. Doppler velocities obtained at all levels as well. Incidental note of a large round structure superior to the aorta. Further investigation performed with diameter and velocity measurements, as well as color flow images obtained. What technique did you feel was most important for this exam? Expanding the exam protocol when something out of the ordinary was noted. Results AAA 3.8 x 3.8 cm. 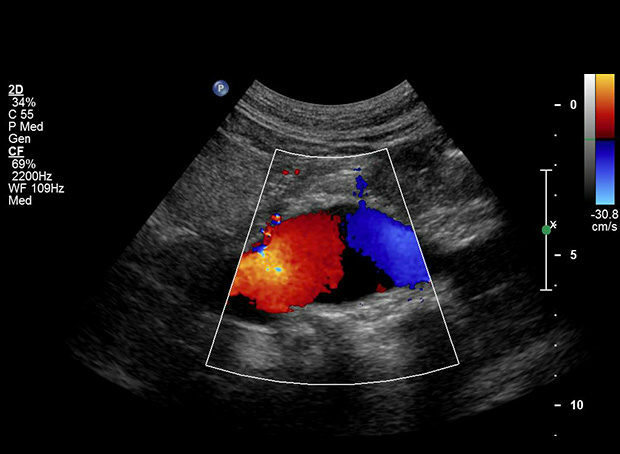 Right CIA aneurysm 2.4 cm, left 1.8 cm. 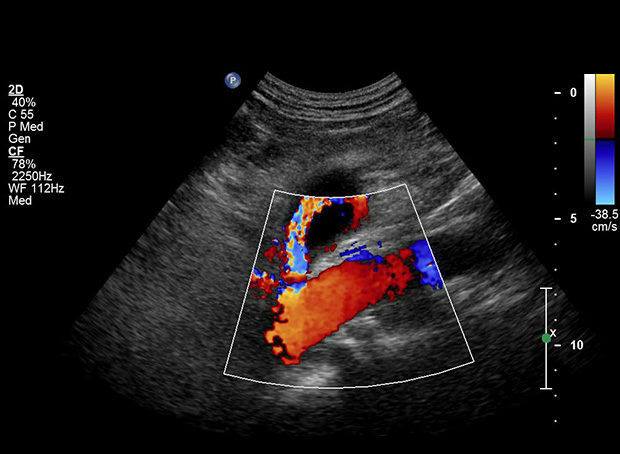 Incidental finding of superior mesenteric artery aneurysm measuring 3.5 x 3.0 cm with mural thrombus noted and lumen diameter 0.77 cm. Cancer is non-aggressive, so doctors and patient opted for surveillance rather than surgical treatment. He had one round of oral chemotherapy after a follow-up CT revealed mild progression. Mass shrunk with treatment. Now on maintenance Rituxan for 2 years. Continues follow-up CT and PET scans as recommended by oncologist. 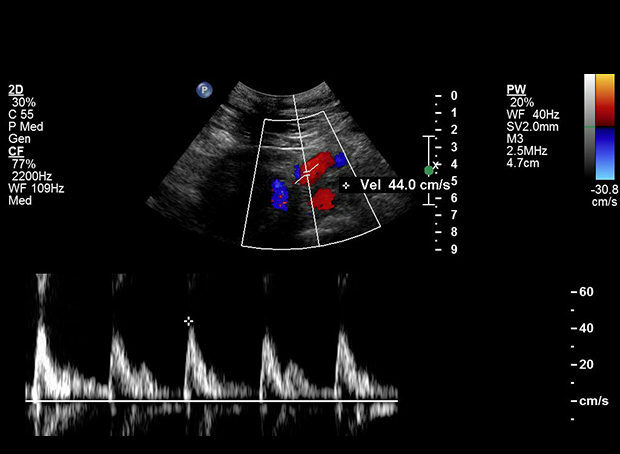 AAA surveillance with ultrasound every 6 months.